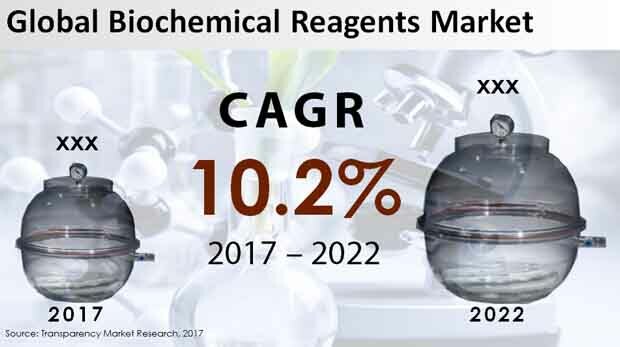 The global biochemical reagents market is foretold to gain a good boost in its growth in the next few years on account of detection sensitivity and the advent of new methods, materials, and technology related to clinical biochemistry. The clinical biochemistry technology is reaching a new level, differing from where it was a decade ago, due to the aggressive development of instrument speed and precision. Today, clinical diagnosis needs could be fulfilled with the use of biochemical analyzer, which is expected to detect a number of projects that cannot be detected with the help of traditional biochemical methods. Considering the development of biochemical tests being highly related to a nation’s healthcare improvement, biochemical detection could be a critical part of clinical testing. The global biochemical reagents market is foreseen to post a CAGR of 10.2% between 2017 and 2022. By the concluding forecast year, the market could collect a revenue of US$23.1 bn after succeeding from a US$14.2 bn achieved in 2017. The world biochemical reagents market is prognosticated to be segregated into polymerase chain reaction (PCR) reagent kits, cell and tissue culture reagents, electrophoresis reagents, chromatography reagents, and others as per product classification. According to the report, the market could witness the dominance of chromatography reagents in the coming years. As per the statistics, this segment could gain a total share of 39.6% by 2022 end. During the tenure of the forecast period, the segment is anticipated to expand at an annual growth of approximately US$0.5 bn. This growth could be greater than any other segment in the product category. As per end user, the world biochemical reagents market is prophesied to be classified into hospitals, diagnostic centers, academics and research, pharma and biotech companies, and contract research organizations (CROs). The analysts provide critical information about the leading segment in this category. In terms of geographical segmentation, the international biochemical reagents market is envisaged to be cataloged into Europe, North America, the Middle East and Africa (MEA), Asia Pacific except Japan (APEJ), Japan, and Latin America. Amongst these key regions, North America could exhibit a lion’s share in the market while growing at a CAGR of 10.9%. In 2017, it dominated the market on the basis of revenue. This trend is predicted to continue to take shape in the market throughout the course of the forecast period. Projected to reach a revenue valuation of US$6.5 bn by the end of 2022, Europe could be next on the list of most lucrative markets for biochemical reagents. Japan is envisioned to expand at a CAGR of 9.7% but may not garner an impressive revenue until the final forecast year. The MEA could be another market with a sluggish growth. Some of the prominent players operating in the worldwide biochemical reagents market could be Beckton, Dickinson & Company, Merck & Co., Inc., Abbott Laboratories, Agilent Technologies, Inc., and Waters Corporation. The global biochemical reagents market is expected to attract focus due its participation in the development of the future of laboratory medicine alongside other markets in the same category. Biochemical reagents could refer to organic compounds or biological materials related to medical research, clinical diagnostics, and life science research reagents. The basic components of organisms chemically synthesized or extracted from the organism could be engaged for biological products manufacturing and biological component identification. Biological reagents could develop into a sizable class of chemical reagents with the development of life sciences. As a result, there could be thousands of types of commodities available. With a complete analysis of the global biochemical reagents market, readers could be confident of making a strong progress in their individual businesses. The authors of the report explain some of the most crucial factors deemed significant and that could impact the growth of the market. The world biochemical reagents market is prophesied to be motivated for an enduring growth due to a wide range of products finding application in the differentiation between bacteria and identification of specific metabolisms. Classical biochemical tests could be often employed for the identification of microorganisms. Most of the time, detection could be based on how an enzyme reacts with a particular substrate. Besides this, there could be complex building techniques or methods put to practice for detecting specific metabolites through chemical reaction. The result could help to achieve a better cognition of the unidentified organism. Methyl Red solution for microbiology, for instance, could be used to visualize the difference between bacteria that form enormous amounts of acid and those that produce less or no free acid as a result of the pH value of the medium falling distinct. The international biochemical reagents market is envisaged to be classified according to product and end user. As per product segmentation, the market could be divided into five segments, viz. polymerase chain reaction (PCR) reagent kits, cell and tissue culture reagents, electrophoresis reagents, chromatography reagents, and others. Out of these segments, chromatography reagents are projected to hold a larger share in the market by the end of 2022. In 2017, this market was valued at a US$6.3 bn. By end user, the international biochemical reagents market could be segregated into hospitals, diagnostic centers, academics and research, pharma and biotech companies, and contract research organizations (CROs). By region, the international biochemical reagents market is envisioned to see a classification into Europe, North America, the Middle East and Africa (MEA), Asia Pacific except Japan (APEJ), and Latin America. Japan could be another market for biochemical reagents as per geography. Amongst these, North America is forecasted to take a leading share in the market. In 2017, it earned a US$5.4 bn. The analysts profile some of the chief players of the worldwide biochemical reagents market, viz. Beckton, Dickinson & Company, Merck & Co., Inc., Abbott Laboratories, Agilent Technologies, Inc., Waters Corporation, Siemens Healthineers, Thermo Fisher Scientific, Inc., Bio-Rad Laboratories, Roche Holding AG, and Johnson & Johnson.